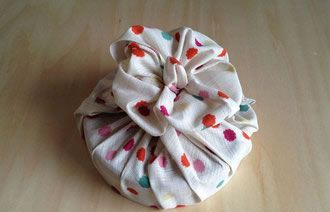 Furoshiki are square cloths often used for wrapping. Their sizes are usually 100cm, 70cm, or 50cm and you can use them on all sorts of occasions. It is said that Japanese people started to use this type of cloth during the Nara Era (710-794). When public baths became popular in the Edo Era (1603-1868), people started to use furoshiki more as carry bags for their clothes. The good thing about furoshiki is that you can wrap almost anything regardless of the shape or size. People use them as gift wrapping, shopping bag, picnic rug, tissue box cover and so on. 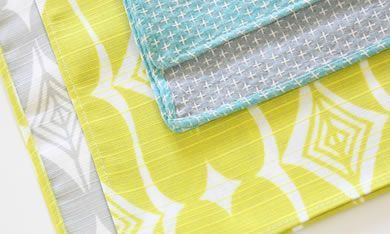 There are many lovely patterns often designed by famous graphic or fashion designers. 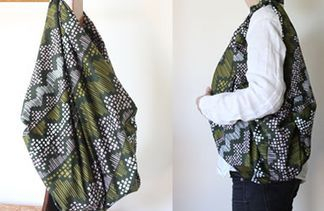 Because furoshiki designs are all unique, it's great to use them as fabric and to make something special from them too. How to make a "Drop Bag"
How to make a "Flower Wrap"